One night I received an email from my sister-in-law's good friend Heather Johnson (of Family Volley). Heather she asked if she could throw me a virtual baby shower. I was really intrigued because, as my friends know, I am not really a shower kind of gal. I have my intense insecurities and attending party-showers are one of them. Is there some sort of therapy for that? Call me. Don't call me, actually because as long as we are talking about intense insecurities the phone tops that list. So, just, nevermind. A virtual shower wouldn't require my bumbling presence or my wild nervous-induced social inappropriateness. I wouldn't have to apologize in every thank you card I write. So I said, sure! That sounds fun! Let's make it a party. But see, what I didn't know was, Heather planned a HUGE VIRTUAL SHOWER with lots of gifts and giveaways for everyone from some of my favorite companies and kind posts from my friends. And as I sit here and write this, I am overcome. Mostly because I am pretty sure I don't deserve one second of it and also because I can't believe someone would do something so grand for me. Especially someone who I have only really met once in real life. If ever someone doubts the charitable side of blogging, please send them my way. 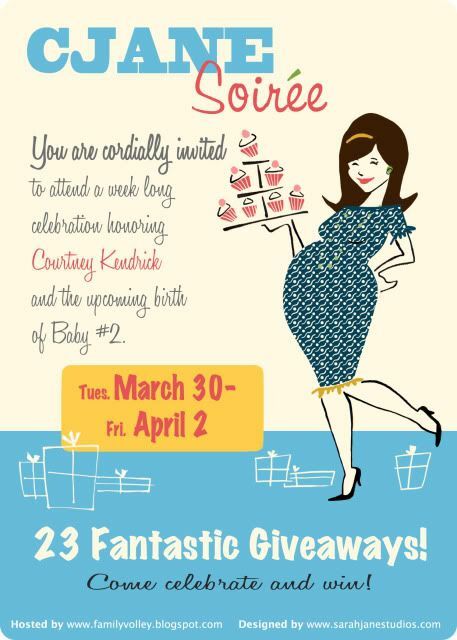 So this week on my dearcjane blog I am going to post about the party and include all the giveaways because I am having a baby! And we should all celebrate! Please come! Print the cute Sara Jane Studios invite(above) and put it on your fridge! I want you to be there and I promise no over-the-top jokes. Well, I can't really promise . . .
Easter Basket Auction For A Great Cause! I mean, a GREAT Cause!